If Mexican food to you means fajitas and burritos, be prepared for new taste sensations at Don Emiliano’s Restaurant in San Jose del Cabo, Mexico. Chef Margarita Carillo de Salinas prepares the best of traditional Mexican fare from old family recipes. But she goes a step further by creating a new gourmet Mexican cuisine with flavors best savored slowly. You won’t find tacos on the menu, but instead try the slowly pit cooked lamb, served with green salsa and sea salt. On first glance it may look like a mini taco, but that’s where the similarity ends. Bean soup may not sound cosmopolitan—until you’ve been served Salinas’s grandmother’s recipe. Thick, hot bean broth is ladled into a pilsner glass garnished with avocado, fresh cheese, and julienned tortilla. It’s a tantalizing taste sensation, a delectable marriage of colonial origins with contemporary sensibilities. And you’ll rave over the grilled scallops with white mole made from pine nut, almonds, and agave juice. 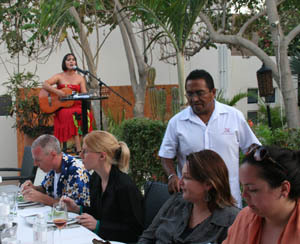 Widely acclaimed as the best restaurant in San Jose del Cabo, Don Emiliano’s provides a memorable dining experience—and an education in authentic Mexican cooking. Margarita (who could forget that name in Mexico?) reinvented the restaurant and its cuisine with her insistence on cooking the dishes she grew up on. “My parents, wherever they are, are looking at me and are proud that I respect Mexican tradition in cooking,” she says. The current menu embraces the great diversity of aromas, tastes, and colors of Mexican food. Still, she’s not afraid to experiment. One of her appetizers, featured in Williams Sonoma’s cookbook, uses raw jicama, a root plant that is usually cooked. Served with fresh tomatillos, aged cheese, and chipotle dressing, simple but subtle flavors honor Chef Salinas’s heritage. 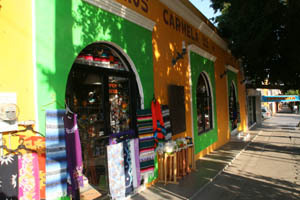 Salinas was recruited to Don Emiliano’s after she had spent seven years in Japan preparing Mexican food for dignitaries. Trained at Le Cordon Bleu, Salinas has dedicated more than 25 years of her career to researching, studying, teaching and cooking Mexican cuisine. 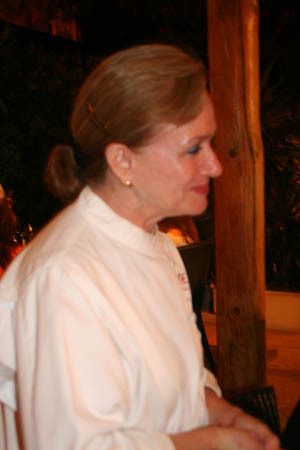 Along with her husband and three sons Chef Margarita co-owns and is the Executive Chef of Don Emiliano in San Jose del Cabo, Casa Mexico in Mexico City and La Colina in Tokyo. She is the leader of the Slow Food movement in Baja. Slow Food promotes appreciation of fine cuisine using regional foods, served in an unhurried atmosphere where visitors can relax and enjoy life in the slow lane, which is exactly the philosophy of Don Emiliano's. A delicious Slow Food entrée is the Filete Nicolasa, a juicy tenderloin of Chihuahua beef prepared with a seared crust of dried chiles. It comes centered on a platter of red hibiscus flower sauce garnished with apple slices sautéed in tequila caramel. Another favorite is the Espiral con Mole de Pollo de Pistache, a delicious dish featuring Chicken crepes in a tantalizing pistachio mole. Not one to bury herself in the kitchen, Salinas roams the modern open air dining area, chatting with guests and sharing stories about her recipes. Her presence, together with excellent food and service, makes dinner a history lesson as well as superb culinary experience. Complement the food with wine from the large selection of Mexican wines, many from Baja California’s emerging Valle de Guadalupe winery region. Entries range from $20 to $36 U.S. dollars; appetizers, soups and salads are $7-$20.